Refrigerators can become cluttered places. Adding to the confusion, amidst all the fresh food waiting to become meals, leftover ingredients lurk behind every corner. Sometimes you may know that you have a half-used tomato, but actually finding it becomes a chore in and of itself. Not so, when using the Produce Saver Set. Designed to look like the food item they contain, the storage devices keep freshness and flavor in, while making it easy to find what you are looking for in the fridge. 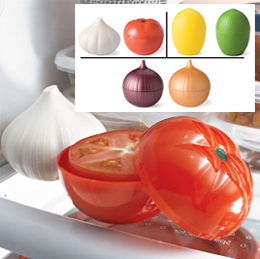 The twist-lock plastic containers are sold in sets of two and come as a red and yellow onion set, a garlic and tomato set, or as a lemon and lime set. Yes! This is a good idea. Can you buy me this?